Learning about land protection at The Cycle Effect's family picnic. There are a wide variety of local organizations that serve youth in this county. 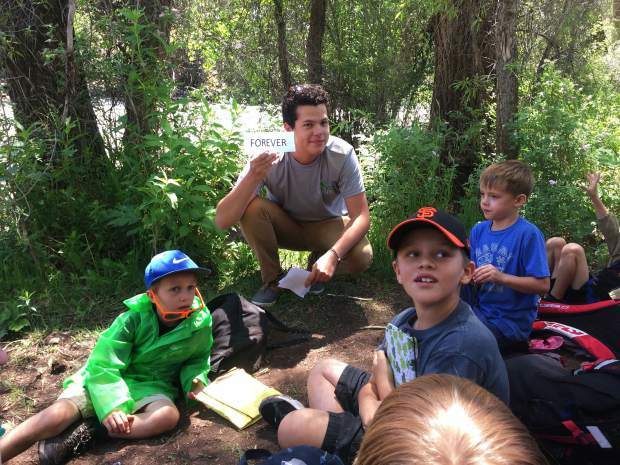 Future Conservationists, Eagle Valley Land Trust’s youth outreach program, was created specifically to educate youth about the importance of land conservation as a foundational element of environmental education. In 2016, the Land Trust and Walking Mountains Science Center entered into a formal partnership to leverage the strengths of these two organizations to increase their collective impact. The combined efforts of the Land Trust and Walking Mountains have improved access to diverse experiential learning opportunities and increased awareness of long-term land conservation efforts among local youth. The partnership has promoted a better connection for youth to nature and fostered a stronger appreciation for environmental issues. Building off that success, the Land Trust has entered into new partnerships with two outstanding organizations to further improve and expand the reach of Future Conservationists: Bright Future Foundation’s Buddy Mentors and The Cycle Effect. The partnership between Bright Future Foundation’s Buddy Mentors and the Land Trust will help both organizations facilitate opportunities for youth and mentors to benefit from the therapeutic values of natural outdoor experiences. These experiences help promote a better connection to nature, which in turn helps participants build trusting relationships, develop self-esteem and increase self-sufficiency. Together, the Land Trust and The Cycle Effect aim to foster a better understanding of the impact that permanently conserved open spaces have in building healthier communities and people, ensuring stronger futures for all. This partnership will give young women increased access to experiential learning opportunities, improve connections to nature and foster stronger appreciation for conservation’s role in community building and personal wellness. Community collaboration is critical to conservation. We are fortunate to have so many great organizations dedicated to increasing opportunities for local youth in Eagle County. Partnering together is a win for all. Each partnering organization produces more impact together than it could alone, and more youth receive meaningful experiences in our treasured landscapes. We hope that these experiences inspire the next generation to enjoy and steward the lands we love … forever. Jessica Foulis is the stewardship and outreach manager at the Eagle Valley Land Trust. If you are interested in learning more about Future Conservationists or if your organization is interested in partnering, then email her at jfoulis@evlt.org. Eagle Valley Land Trust conserves forever the lands we love, building a permanent legacy for future generations. Founded in 1981, the Land Trust is a nonprofit organization accredited by the national Land Trust Alliance. Conserved lands include Hardscrabble Ranch in Eagle, the West Avon Preserve in Avon and the East Vail waterfall in Vail. Learn more and make a tax-deductible donation at http://www.evlt.org.